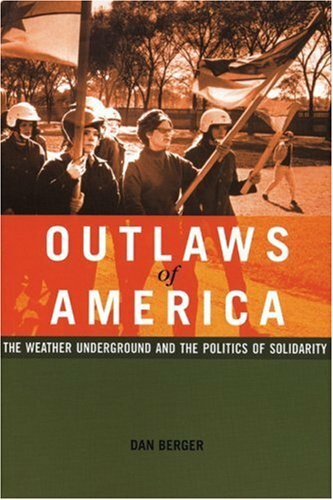 Outlaws of America is an interesting and refreshing look at a somewhat overdone subject, the Weather Underground. The use of interviews with David Gilbert, Bernardine Dohrn and many other former members of WUO, as well as an array of former members from revolutionary groups like the Black Liberation Army and Puerto Rican nationalist groups really brings the subject to life. Dan Berger also emphasizes throughout the book the relevance to today’s movements, and points particularly to the prison abolition and global justice movements as places where the legacy of Weather can be seen. The book delves into the difficult past/present of armed struggle and state repression, and does a good job of keeping criticisms of the group grounded in the bigger picture of state violence. Some of the 70s history is unnecessary for most readers, but there’s also a lot of proactive criticism of the lack of feminist and queer analysis or practice within Weather, and even the racist mistakes which happened too often and too dramatically for comfort. These are the most important lessons I drew. This is not necessarily a complete history, but Dan does a much better job approaching the subject critically and from a radical perspective, than most other authors, who tend to condemn and dismiss Weather as stupid and insignificant. Still, this book takes a view of Weather which is rosier than mine, and for me leaves a good deal of questions lingering. What did Weather give up when they dumped SDS? Why did they pursue such a short-sighted strategy when they turned to bombs instead of organizing? How did they allow themselves, or even encourage themselves, to become isolated from the mass movement around them, instead of seeing themselves as a part of it? What’s a better way for white privileged organizers to be effective anti-racists and stand in solidarity when the state is brutally attacking the movements of people of color?